The HoverTank military crafts were the pioneers of hovercraft for military applications. 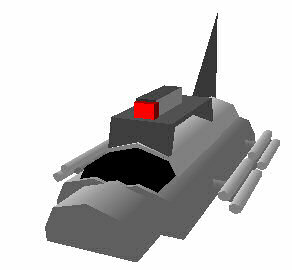 The introductory HoverTank model is the Mark 1. This hovertank is armed with a forward-facing fusion cannon and eight Class I rockets mounted on two launchers. The cockpit features basic craft control systems and crude targeting computers. Aiming while driving is not needed since the cannon and the rockets both only face forward, which makes it easier on the single pilot to operate it in combat. The craft features a tall stability fin like the HoverCar 5000 from MAD Hovercraft. Its propulsion drive system is unknown, as the plans for the craft were lost in a fire. Because of its age, MadCorp stopped building it, but rumors are that it can one can be acquired through a small third-party workshop somewhere outside the city. Following the Mark I model, the Mark II was introduced to provide the pilot with more firepower than ever before. This craft is considerably larger than the Mark I, however it also is a hovering arsenal, with two Class II unguided rockets mounted on external launchers. 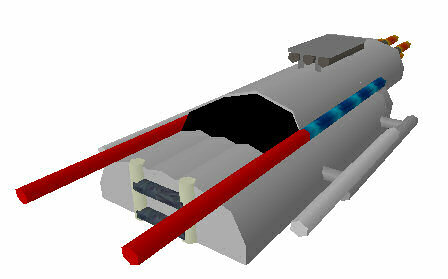 An additional RocketPack can allow the rocket launcher units to retract into the body of the craft and reload. It also adds four rockets that can be loaded on to the launchers in this manner. The 7 engines run on a still-classified fuel system with energy boosts from two Revision 1 energy collector units. There are also a rare two waste energy dispersal units on this craft, not many others have them. Keeping the weight stable are weights in the rocket launchers and pop-out stability wings in the event that an engine fails and the craft needs to come to a safe stop. Cockpit systems remain somewhat unchanged since the Mark I model, except added software for controlling the engines as well as more advanced targeting systems were added. Following the discontinuation of the HoverTank Mk 1, this model was moved into the entry-level category, with the forward mounted weaponry it is easier for the single pilot to drive and fight at the same time.